Culturelle is a probiotic with 10 billion cells of 1 strain, Lactobacillus GG or more specifically, Lactobacillus rhamnosus subsp. GG. Culturelle has 1 probiotic strain. The capsules themselves are not enteric coated. EacH capsule has 10 billion cells. It does not have any prebioticS. Culturelle has no dyes or artificial ingredients. Culturelle has 10 billion CFUs of 1 probiotic strain. It has no enteric coating and no prebiotic. Prebiotics Prebiotics are a food source for probiotics. Culturelle has no prebiotic. Inulin Prebiotics Inulin prebiotics nourish probiotic organisms on the left side of the colon because they take longer to ferment. Number of Probiotic Strains There are thousands of different kinds of organisms living in your colon. Some are more helpful than others. 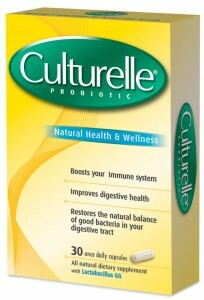 Culturelle has 1 probiotic strain. Number of CFUs (in billions) CFU stands for Colony Forming Unit which is representative of the number of organisms in the product. Each capsule of Culturelle has 10 billion CFUs. Enteric Coating Digestive juices may destroy many probiotic organisms. An enteric coating or delayed-release system that releases probiotics in the colon may help keep them alive. Culturelle capsules do not have an enteric coating. No artificial coloring or dyes Culturelle does not have any artificial dyes or coloring.